Ad blocking has been a super hot topic in marketing this year. And it has become the hottest topic in marketing during the last week or so as Apple released the latest mobile OS for iPhones and iPads that allows mobile ad blockers. Ad blockers quickly rose to the top of the app charts all around the world. So go get ’em! Ad blocking technology is becoming a big threat for advertisers who are trying to reach consumers with brand promotion. And it’s a big threat to publishers around the world who are reliant on those ad impressions to sell banners and sponsorships. It’s easy to see why this trend is really taking off. And getting more and more attention by the marketing and media crowd. Today’s consumers want a fast, ad-free web experience, with less tracking of personal information by unknown third parties. And they are finding ways to block ads through their peers and research online. Based on the latest study by Adobe and PageFair, there are approximately 200 million monthly active users of ad-block software globally. Ad-block is also catching on in the US, the study reported 45 million of active users as of June 2015, which is about a 50% increase compared to last year. The number of ad-block users is expected to only go up in the coming years. Adobe and PageFair found that ad-block users are typically younger, tech savvy, and are more likely to use ad blockers than any other age groups. 41% of all the respondents surveyed between the ages of 18 and 29 years old said they use ad blockers. It’s a worrying trend for brands who are trying to reach the millennial generation. And a more recent study by Comscore says that ad blocking is now in use by 10% of US consumers. As many as 24% and 27% of internet users in Germany and France are using ad blockingsoftware to prevent ads from interrupting their content experiences. Ad blocking has already become a big issue for digital media companies, whose primary revenue comes from advertising. If ad blocking on mobile reaches similar usage levels as desktop, US digital media companies could see as much as $9.7 billion in lost revenue next year. Take Google as an example, PageFair estimated the company made $59.1 billion from advertising in 2014, but lost $6.6 billion because of ad blocking. Similarly, publishers are expected to lose more than $21.8 billion in revenue this year due to ad-blocking. Adobe and PageFair predicted that number will rise to $41.4 billion next year. CBS Interactive’s chief revenue officer David Morris agrees ad blocking is becoming a major threat for publishers. Of the 20 sites CBS Interactive owns, the percentage of ad-block users can go up as high as 40%. Ad blocking is only going to become even more common with last week’s release of Apple’s new mobile operating system iOS9, which for the very first time will allow app makers and mobile users to block ads on iPhones and iPads. Globally, Apple’s Safari mobile browser currently accounts for 52% of mobile browsing and 14% of total web browsing. By making it easier to block ads on mobile, ad block usage is expected to increase significantly when iOS9 becomes available. With its iOS9 launch this month, the number of mobile ad blocking is only expected to increase. But even before Apple’s announcement, usage of mobile ad blocking was growing extensively overseas. UC browser, a web browser that is extremely popular in China and India, has an ad blocking feature built into its mobile browser. UC browser reportedly has reached over half a billion global users last March. This number will continue to increase as UC browser looks to grow their regional and international user base. Financial Times reported that some of the world’s biggest tech companies, including Google, Microsoft and Amazon, are now paying owners of ad block software to unblock their ads on their websites. One of the most popular ad block software, AdBlock Plus, claims they have approximately 50-60 million active users worldwide, and that their software has been installed on people’s browsers more than 400 million times. Pro: By paying ad blockers, you do not need to worry about ad blocking on your site. Con: Ad blockers may jack up rates for their “whitelisting” services. 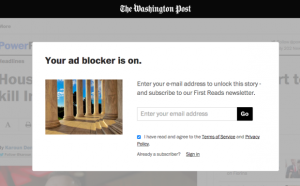 And if you want to continue unblocking your ads on your websites, you have no other choices but to hand over more cash. Ad blockers are like people, they cannot always recognize that a piece of content was paid for by a brand, and therefore is an ad to block. One example of native advertising is advertorials found on BuzzFeed or Forbes sponsored by brands. Pro: Native advertising ignores the standard display ad formats, so people cannot always recognize right away that they are ads. Con: While ad blockers can’t block advertorials, they can block the paid placements that direct people to the branded content. Many publishers run pop-ups when people visit their sites with ad blockers enabled, explaining how ad blocking is threatening their businesses and their ability to hire people to create the content visitors enjoy. Viewers are then presented with the option to disable their ad blockers to display the ads. Pro: This approach deals with the ad blocking problem head on. People may not like ads, but they may hate the idea even more of not being able to visit and read their favorite sites for free. Con: It may not be very effective. Sean Blanchfield, the CEO of PageFair, tested this approach on their 140 websites, and the conversion rate was less than a disappointing 1%. Publishers can simply choose to not let people with ad blockers enabled to view their content. This approach is being tested by The Washington Post. Pro: Visitors must view ads if they want to check out your content. Con: This approach may create an adversarial relationship between you and your audience. And if your content isn’t original enough and can be found on other sites that allow ad blockers, it won’t be a very effective solution. Freemium model offers people two types of access to a website: a free, ad-supported version and a paid, ad-free version. Companies like Spotify and Pandora, for example, currently operate on a freemium model. Pro: This approach gives people what they want. If they want a faster, ad-free web experience, then they may be willing to pay for it. Con: Spotify and Pandora are able to operate with this approach because the content they offer in exchange for money doesn’t necessarily lose value or interest for their subscribers over time like news articles do. And even for Spotify and Pandora, they still rely on ad-supported services for the majority of their users and revenue. Ever since the advent of the DVR, it’s clear that given the choice, many, if not most, consumers would rather skip ads pretty much anywhere they encounter them. This is why I help brands create content people actually want to read, content that is so good that they want to share, content they might even love. Of course there is a war on advertising because no one ever asked for ads. And publishers have simply been too slow to respond to the reality and changes brought on by the social web. As usage of desktop and mobile ad blocking continues to grow, it will only become more difficult to reach people through traditional advertising. Promotional content simply does not work anymore. Ads have taught us all how to become great filters: ignoring the promotion we don’t want to see, and now we have the technology to get even better at it. To win the battle for customer attention, brands need to think and act like publishers, creating authentic, engaging, and original content that people actually want to see. We need to stop selling in the content we create. And focus on building relationships with people who love our content so much they subscribe to it. Let me know if you need help educating your team on how to create content people actually want? Being someone in that 18-29 age bracket that blocks ads, the reason I block them isn’t because I’m worried about tracking (though I find ad retargeting annoying). I’m a tech savvy person who’s frustrated with being served ads from compromised ad networks that propagate malware. I end up installing ad-blockers on the devices of family members, because I’m fed-up of being called out to clean up machines crawling with malware obtained from dodgy ads. If advertisers want people like me to stop blocking ads en masse then the industry as a whole needs to try to do more to keep networks clean and shut down ones that aren’t. That’s a great point Emily. I use it them more for page load time and the tracking is secondary. Ad-blocking is indeed a big challenge for digital media companies but this is also a wake-up call for most of these companies to focus on personalization and engagement. Truth is, this will encourage advertisers and businesses to take a deeper look on how they present themselves to their target audience which in the long run will result to better digital marketing practices and less invasive ways to get attention.